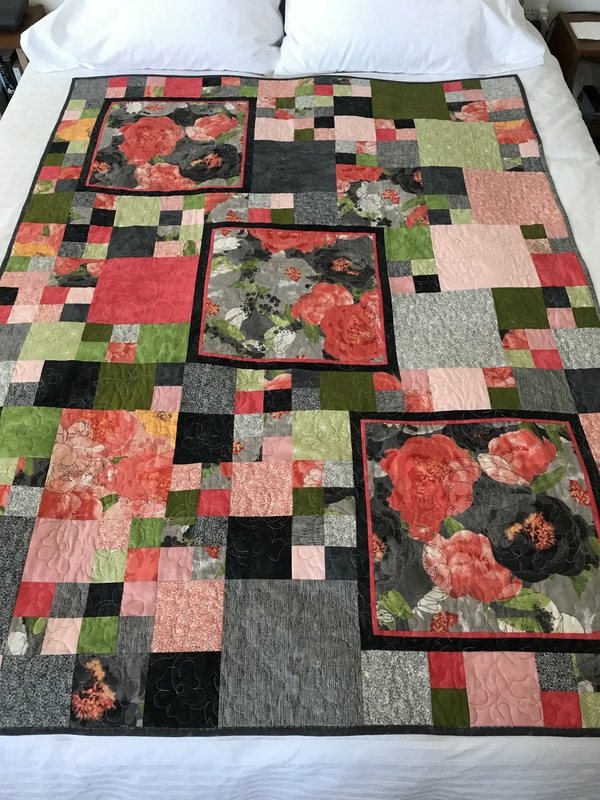 The question is whether I use the scaled down single flower stitch-out I set up from the original quilting embroidery to tie those spots, or to leave well enough alone…. At the moment, I’m predisposed to leaving the quilt as it is but I’ll keep mulling this one over – I may in the end do those embroideries. The binding – my original plan was to do a hidden binding but in the end I did a narrow binding the way many people do it – by folding a 2.5″ strip in half, sewing the doubled binding ~3/8″ from the edge, folding it over, sewing it with a decorative stitch. 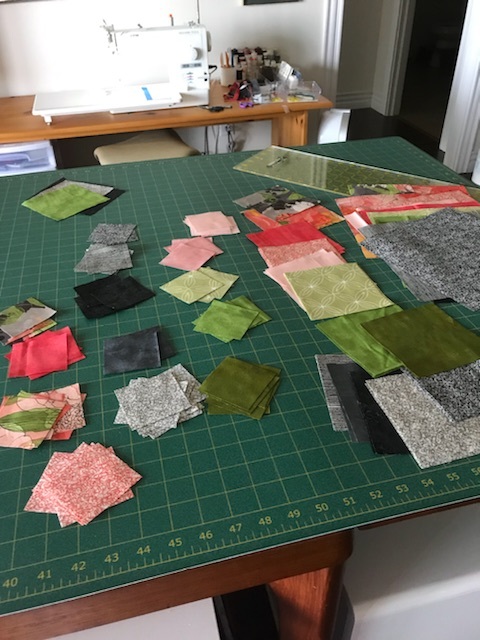 It turned out to be considerably more work than my usual 5/8″ single thickness binding which sews on more easily and folds over and corners with much less effort. However, I didn’t want a prominent binding so I settled for this narrow one. Probably won’t do this again – either a hidden binding or a standard 5/8″ one. 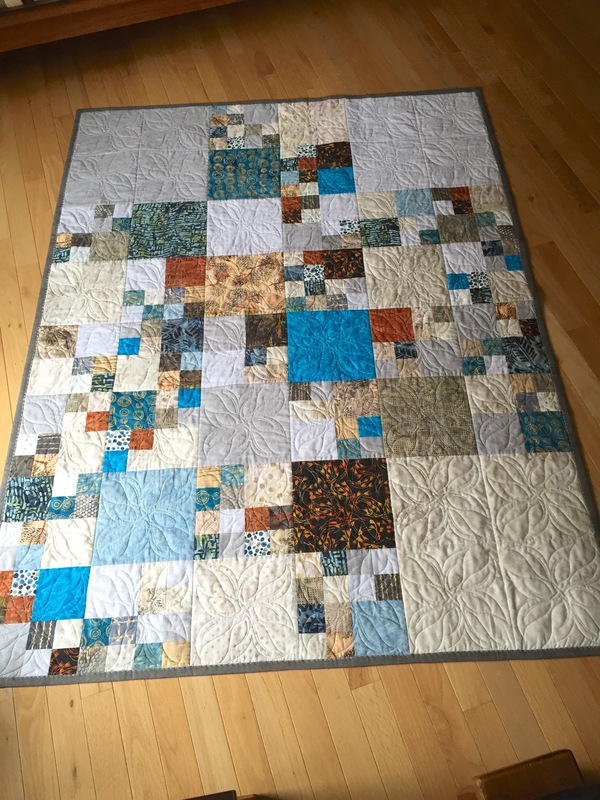 Now my next decision is what to make from the leftover fabric – some kind of simple quilt that I don’t have to fuss over too much. 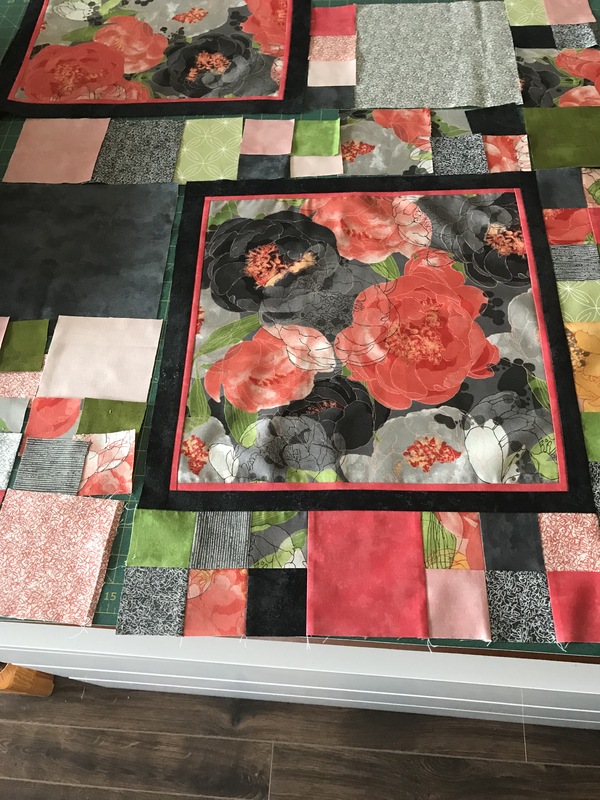 I was thinking “Garden Trellis” would be easy to do – using 2 1/2″ strips of the Blushing Peonies fabrics to set up the HST blocks – BUT I see the centre of the on-point blocks being unpieced squares of the peony fabric – I have just enough to do that. 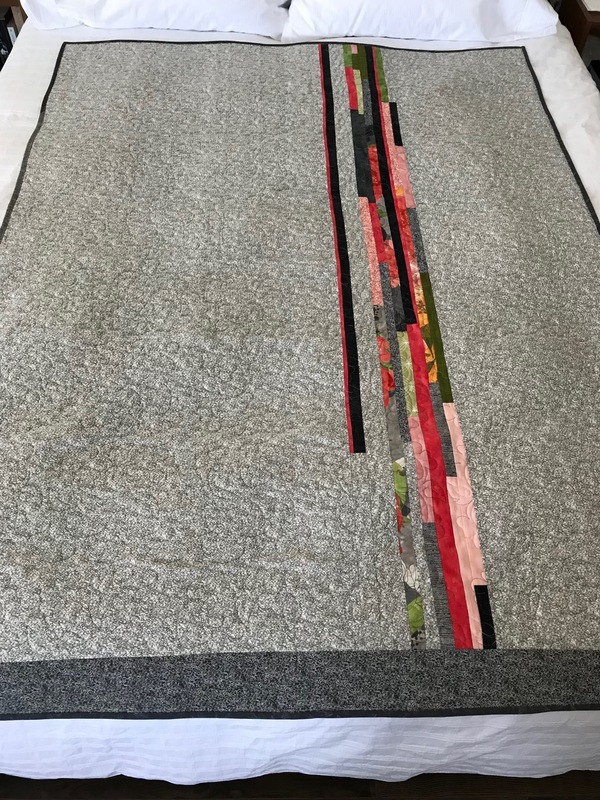 However, the piecing is somewhat complicated – in Garden Trellis II I created the coloured squares by piecing them in after I’d created the dark/light blocks. In this instance I want to showcase intact peonies. The easy way to achieve the appearance I’m after is to log-cabin the central square; but I want the seams of the block to be on the diagonal they way they are with HST blocks. I can see I’m going to have to make some mock-up blocks to work out how to construct them. Again, I’ll probably do a 6 x 8 block quilt which means 48 blocks constructed with somewhat complicated sewing, I think. Well, next some some playing around.